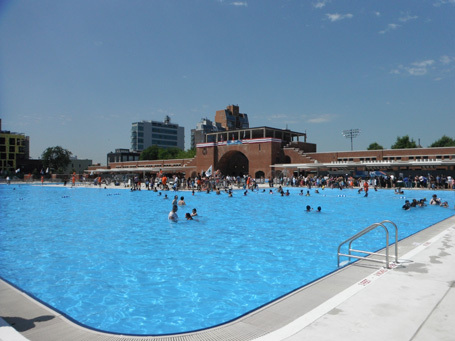 The famed McCarren Park Pool in Brooklyn, New York, opened in 1936 (with a capacity of 6,800 patrons and the size of four Olympic-sized pools), and was the summertime social hub for Greenpoint and Williamsburg neighborhoods in Brooklyn, New York. McCarren Pool ceased being a watery oasis in 1984, but was open to the public in 2005 when it opened as a popular venue for concerts, dance, and movies. Separate area for lap and recreational swimming with depths ranging from 3.5 ft. to 4.5 ft.
Activating the main pool for swimming with a capacity of over 1500 swimmers, the new open-air changing pavilions were designed on the pool deck. These pavilions allow the original bathhouse to be converted into a year-round community center containing a gym, weight and cardio areas; multipurpose community and meeting rooms; and offices and support spaces for staff and NYC Parks police. The building is targeting Leadership in Energy and Environmental Design (LEED) certification for sustainable design with the U.S. Green Building Council.